STEP 1 Toss zucchini and salt together in a fine sieve over a large bowl. Set aside for 30 minutes to draw out moisture. Use your hands, squeeze excess moisture from zucchini. Set aside. STEP 2 Meanwhile, preheat oven to 200°C fan-forced. Line two oven trays with baking paper. STEP 3 Combine carrot and cheese in a food processor and process until very finely chopped. Add drained zucchini, egg, 1½ cups breadcrumbs and garlic. Process again until well combined. Season to taste. STEP 4 Place extra 1 cup panko breadcrumbs onto a plate. Using your hands, gently roll tablespoons of the mixture into small balls then coat in extra panko breadcrumbs and arrange on prepared trays. Spray with oil spray. Bake for 20-25 minutes or until golden. Set aside for 5 minutes to cool slightly. 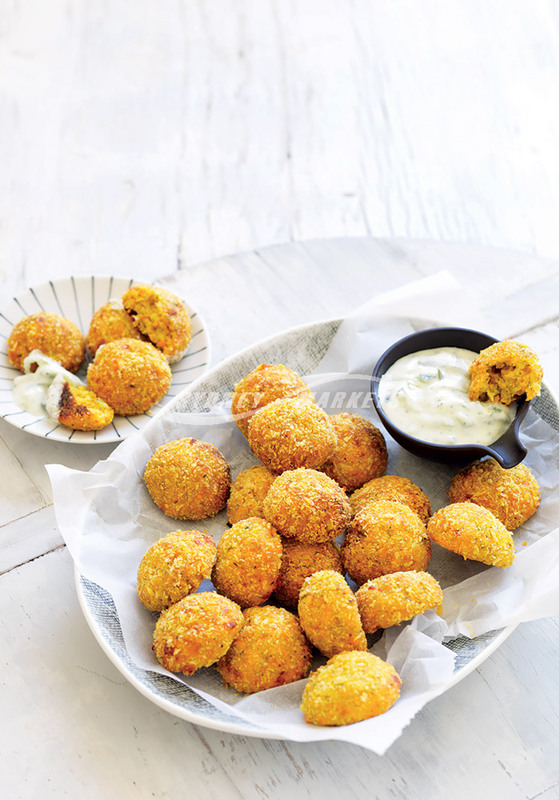 Serve with tzatziki for dipping.